Marketing news and insights from Right Hand Planning. Here we take a look at three marketing examples, two from social media and the third is an interesting case we saw while out and about around town so let's take a quick look. Well, newspapers are obviously having a hard time keeping up online so I don't know that looking at their Heritage position and focusing back on their history is the best example to use newspapers struggle for relevance in the Digital Age. Also there's not a lot of reader benefit other than please support us and that’s sort of sad for a business struggling to keep up online. Another approach would have been to focus on their shift to the online world and tie it to a benefit the reader, such as anytime online access. Then they could say something like, "The LA times now available on tablet mobile and desktop." 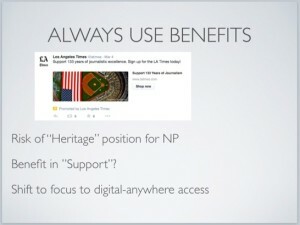 Or "Do you know you can access and read us anywhere with the new digital LA Times?" So there's a copywriting example. The next one is an interesting PR example. When we first clicked on this the title says obviously "Restaurants everyone's buzzing about." When we clicked through there was only one restaurant so presumably they're promoting themselves as the one that everyone is buzzing about which is great, which is fine. I think when you click on it now they are a couple of other restaurants on that page and so it lends a little more credibility to have other restaurants around town listed also. 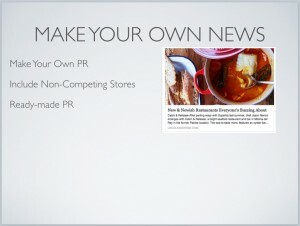 If you want to promote yourself though PR with a press release one smart way to do it would be to put other restaurants on there also that are either not in your neighborhood or category. It could be a dessert restaurant if you're a dinner place or another completely different style of restaurant or be in another part of town. If you put in two or three other restaurants and send it out to neighborhood web sites or local news outlets you would give them ready-made PR that has some sort of balance and credibility instead of the "all about me" traditional press release. This approach might result in some good coverage so your restaurant can be the one everyone is buzzing about, and that's great. Just do it safely by including a couple of non-competing entities and I think this is something smart that feels like real news. This little item we saw in the wood counter at a Starbucks in Redondo Beach, CA. We're not used to powering our phones and tablets and laptops yet on these recharging disks but this is coming out apparently. And this company, rather than wait until the actual product is out, they're warming up the market and they're teaching people what this item is and to keep their eye out for it. 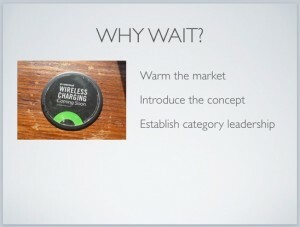 By doing educating people about this new way to charge your electronics early they're essentially positioning themselves as a category leader in wireless charging and their brand as the brand who brings it to you. Their name is basically going to become synonymous for that type of technology so that's a really smart way to get started early even if your product isn't ready for market and especially if it's new or disruptive. So that was really interesting see thing to see while jumping into a Starbucks one morning. That's it for today but going back to the future with other working examples we find online and now the real world.